A component of Thai massage, Thai foot massage was born out of the Ayurvedic medical system in India thousands of years ago. A component of Thai massage, Thai foot massage was born out of the Ayurvedic medical system in India thousands of years ago. It has evolved and the form practiced today reveals influences from the medical systems of China and other eastern Asian countries. Says Lisa Jacobs, a licensed massage therapist based in Asheville, N.C.: “Techniques include and alternate between the stretching of the feet, stimulation of Sen lines [energy pathways], massage techniques using the hands, massage techniques using a wooden tool, stimulation of reflex points with the wooden tool, and pressure applied through a towel-wrapped foot.” There are, in fact, enough techniques used in this extremely thorough foot and lower leg massage to encompass a two-hour session. “Because of its penetrating tissue work, it is ideal for the treatment of plantar fasciitis and other common foot ailments,” says Jacobs. Dancers, hikers, and athletes also enjoy its benefits. 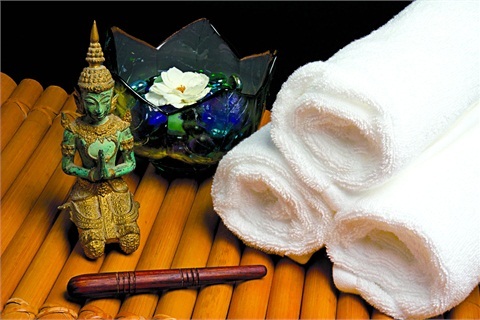 “After receiving a Thai foot massage session, most people experience a profound state of relaxation. Most of my clients sleep very well that evening,” she says.